Today organizations, no matter how large or small, have more data to store and manage than ever before. To make matters even more challenging, the data is saved in multiple forms and in multiple places — from traditional file cabinets to email servers, the Web, smart phones, and other locations. When litigation arises, the task of preserving, collecting, processing, and reviewing this data can be daunting and expensive. 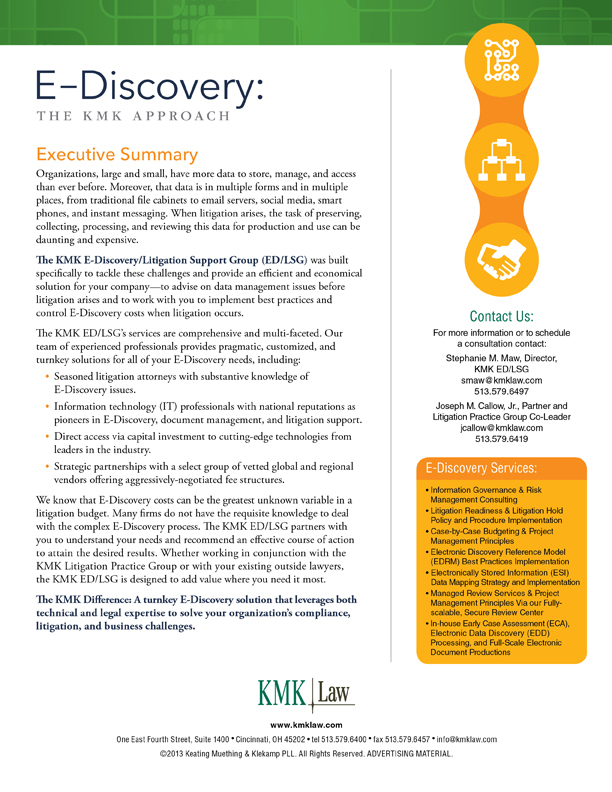 KMK's E-Discovery & Litigation Support Group (ED/LSG) delivers end-to-end electronic discovery strategy, from compliance to technology implementation. 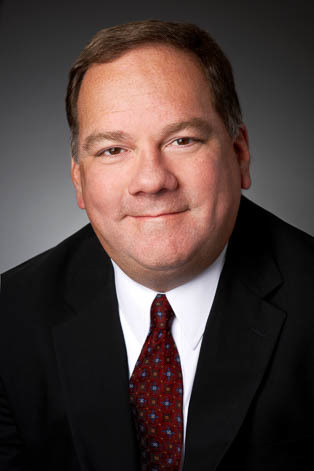 Our interdisciplinary team of attorneys, paralegals, and information technology professionals stays abreast of ever-changing case law and technology, and provides efficient and economical solutions — to advise on data management issues before litigation arises and to control E-Discovery costs after litigation develops. Information management/identification: Locate potential sources of Electronically Stored Information (ESI) and determine its breadth, scope, and depth. Preservation: Use an enterprise level approach to implement the litigation hold in order to ensure legal and technical implementation and protect against inappropriate alteration. Collection: Gather the raw ESI and create a prioritized, targeted ESI Collection Data Map, identify unique and non-duplicative sources of data, and ultimately cull a discrete (and less costly) collection for review and potential production. Processing: Consider the utility of the raw ESI in the discovery process. Early Case Assessment (ECA) Analyses: Employ complex search engine filters and various math- and language-based algorithms to analyze ESI and identify patterns and relationships to objectively determine its relevance to your particular litigation matter and overall case strategy. 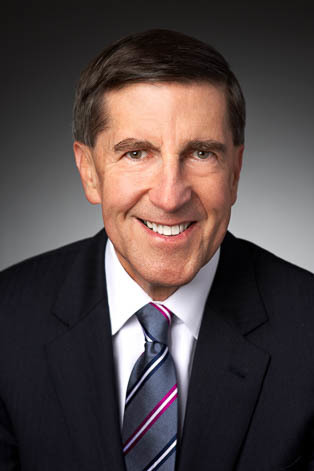 Electronic Data Discovery (EDD) Culling: Reduce the volume of raw ESI using ECA, EDD, Search Term Clustering, Technology Assisted Review (TAR), and related advanced search technologies and methodologies and convert it, as necessary, to a standard litigation database load file format or e-review software format. Electronic document review: Review the resulting ESI for relevance and privilege. We recognize that this is often the most expensive part of the process, and we strategically use our processing methodologies, technologies, and project management best practices to narrow the resulting review set of data. We provide greater accuracy controls as well as tremendous cost savings by only reviewing those documents deemed relevant. Production: Produce documents and data to opposing counsel, government agencies, or other third parties in various standard electronic database load file, images, text files, and native file formats commonly used for suitable delivery mechanisms. 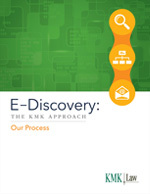 Because this is typically the second most expensive phase of E-Discovery, a defensible yet cost-effective approach to negotiating your Form of Production Agreements is imperative to a successful Production Phase. Presentation: Display ESI before audiences (at depositions, hearings, trials, etc.) in native or near-native forms to elicit further information, validate existing facts or positions, or persuade an audience. Our veteran Trial Technology Manager utilizes a hybrid in-house/outsource approach to provide cost-effective trial presentations including custom illustrative exhibits, illustrative animations, and designated deposition and hearing transcript media. We understand that a fully optimized E-Discovery program requires the right balance of people, processes, and technology. The KMK ED/LSG can act as an extension of your in-house legal department, information technology group, and risk management group. 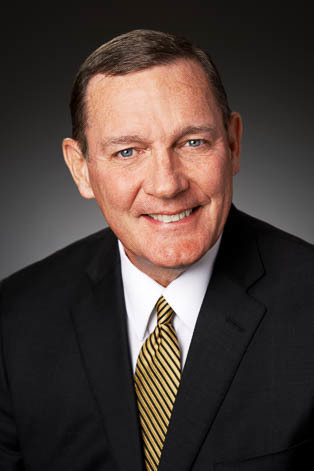 Paired with KMK’s highly respected litigation attorneys, our ED/LSG works seamlessly from the early stages of litigation preparation to deliver the desired results in the most cost effective and efficient manner for our clients. 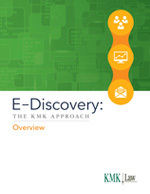 If you have already retained outside counsel, the KMK ED/LSG can work directly with your existing law firm to manage the complex E-Discovery phases of a case. Whether working in conjunction with the KMK Litigation Practice Group or with your existing lawyers, the KMK ED/LSG is designed to add value when you need it most. The Garretson Firm Resolution Group Inc.
"KMK’s litigation team helped us with several document intensive lawsuits in recent years, and their representation, advice and assistance, especially regarding e-discovery issues, was invaluable. We chose to utilize KMK’s Ringtail document management system for several cases, which turned out to be a cost efficient way to organize, locate, review, manage and produce documents from KMK, our office, or any remote location, with little or no duplication of effort. Use of Ringtail, and along with KMK’s litigation experience, gave us the confidence we needed to meet the challenges of the litigation process." 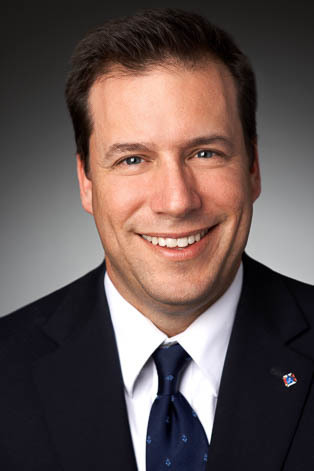 - Stephen Herzog, Esq., Assistant General Counsel, Cincom Systems, Inc.